Tennis champion Roger Federer is an ambassador for Jura, the Swizz manufacturer of coffee machines. 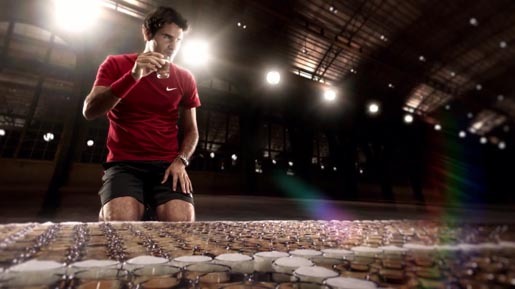 In 2012 Federer’s Jura television commercial brought together the worlds of tennis and coffee, setting up a court made of coffees to test the Jura ENA Micro 9. The Jura Coffee ad was developed at Publicis Zurich. Filming was shot by director Andreas Hoffmann via Panam Film, Zurich, with director of photography Jean Poisson and editor Sven Budelmann. Post production (CG & VFX) was done at Gravity, Tel Aviv, by chief creative/VFX supervisor Ilan Bouni, head of 3D and compositing Yoav Savaryego, head of art and design Israel Breslev.